Anne is a really lovely lady that I admire, she has been through quite a bit over the last few years but she stayed positive and came at the other end. A fighter and I like that in people. Chocolate Chip, Crumb Cake (woohoo) So Saffron and Taken with Teal and a bit of olive for the leaves. Vintage Vogue set and I stamped and layered three of the main flower heads. 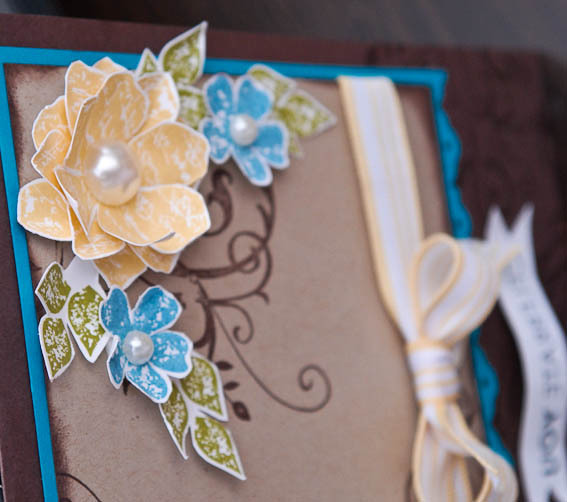 The little leaves I stamped in threes and cut around them leaving some extra card to add glue to and stick behind the flowers. I added some flat pearls in the centres as well. 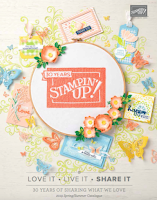 The Crumb Cake background was stamped with the Baroque motifs swirl in chocolate chip ink. Stripy So Saffron ribbon and a sentiment banner completes the elegant look. I really like how it turned out. Anne I hope you will have a fabulous Birthday and you get spoilt rotten. Right I am off as I have 1 millioooooooon of things to do before I meet up with lots of my wonderful Passionettes and fellow demos in Manchester tonight for a Regional Training. I cannot wait I love those fabulous girls !!!! Oh my what a beautiful card, lucky Anne, Happy birthday Anne! The card is just gorgeous. And I love that you say "her HAPPY BIRTHDAY"! This is such a beautiful vintage card. I love how you used baroque motifs with the vintage set. Love the colour selection. You always do such amazing colour selections. I'd never have thought of putting that colour combo together but it just works so fabulously! 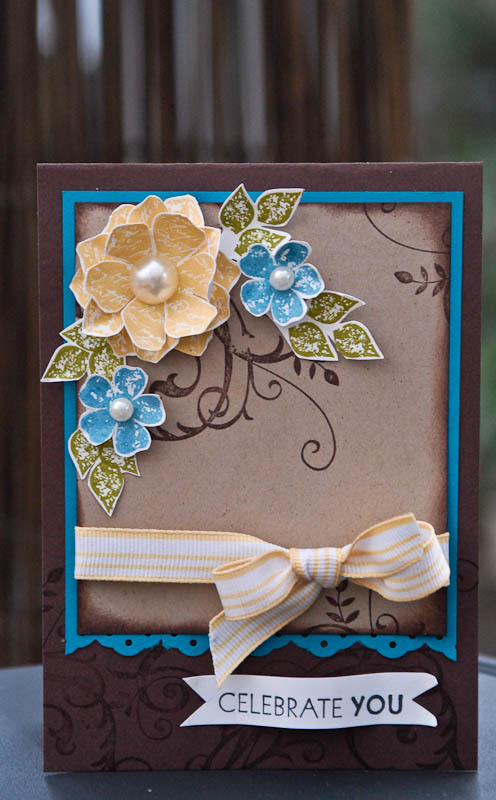 It's a beautiful card and I'm sure that your friend will be really happy to receive it.